You’ve made the responsible choice to create a Living Trust to ensure your well-being and protection. You deserve to know that the assets for which you have worked so hard will be available during incapacity and eventually pass smoothly to those you love. That’s why we are inviting you to get your Trust “checked out” at no charge. We’ll review your Trust Documents and give you a complimentary 14-point written analysis revealing which areas leave you and your family vulnerable. 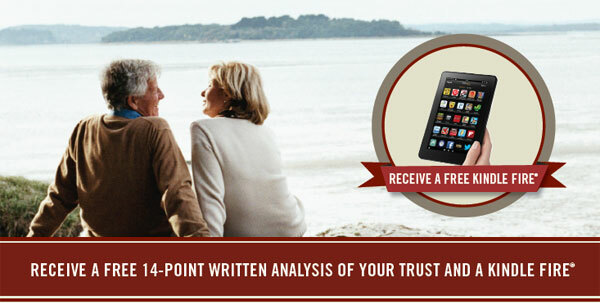 Immediately following the workshop, you will receive the 14-point written analysis and a free Kindle Fire®. Remember, you must bring your Trust Documents to the workshop and have them reviewed to receive the free Kindle Fire®. 12 p.m. or 6 p.m.
To qualify for the free Kindle: Trust documents must be notarized at least 1 year prior to the workshop attended and not previously reviewed by our firm. 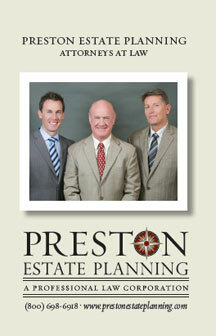 Life Plan™ members of Preston Estate Planning, APLC are not eligible. Trustor must attend workshop. Only one Kindle per household. Attorneys in attendance will be charged $1,000.